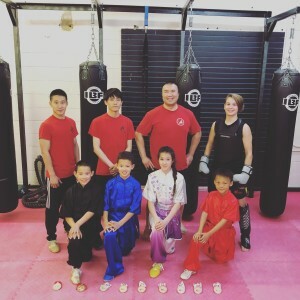 This class consists of modern and traditional Wushu training. Wushu, also known as kung-fu, is maybe the most challenging martial arts and has fashioned its place among current action/martial arts films. Taolu training is a high intensity workout which places great importance on stretching and conditioning. The training can be compared to gymnastics with its sequences of movements, which include basics, combos and a number of aerial acrobatics. Along with this, official international routines (standardized by the International Wushu Federation) are taught, such as empty-hand (Chang-quan and Nan-quan) and weapons (Jianshu, Daoshu, Qiangshu, and Gunshu) forms. Congratulations to Grace Wiebe for representing team Canada at the 2018 Pan American Games in Buenos Aries, Argentina. This was the first time any athlete from Saskatchewan has qualified to represent the nation. Congratulations to the team members who competed at the 2018 National Junior Team Trials in Toronto this year. 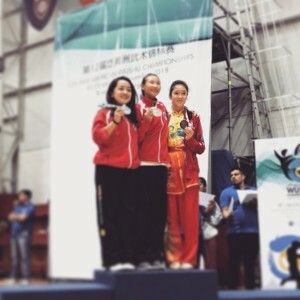 For the very first time in Saskatchewan, we have two athletes qualify to represent team Canada at International Wushu Competitions this year in both Taolu and Sanshou.